I got a 6 month old blue merle Aussie about 14 years ago. He was to be trained as my service dog and help me through college and life. The trainer told me it would take time to teach him to use a backpack, but the first time I put it on him, he knew exactly what to do. He is the smartest dog I have ever known and was my emotional rock, as well as physical stability. He could alert my seizures and vertigo and if I got upset, he laid in my lap and forced me to pet him. One day, we were in a crowd of people and a young woman was against the wall crying. Zeus went over to her, sat down and put his paws on both her shoulder. She pulled him close and just cried into his fur. Everyone around awwed at how sensitive Zeus was to this woman who just needed a friend. In college, where I trained to be a photographer, Zeus would help carry equipment and school books. Because he was always with me, he became a model for photography classes and started doing photography work. He has met many celebrities, all of whom (except Mario Lopez) wanted their photo taken with him. He has been truly the best friend I could ever have. Although his days of work are now gone, as he has a few health issues of his own, he is still my best friend and no other dog will ever be able to take his place. Your dog Zeus is beautiful. He reminds me of our Aussie who also came from Nashville. His original name was Zeke. We got him from the ARPH rescue organization. It was amazing that someone could give up such a beautiful dog. He was 5 months old when we adopted him. He was renamed Cooper and has been having a wonderful life in Virginia. The funny thing he does is lay across my lap when I'm upset too. He is a blue merle with exact markings as Zeus. No blue eye though. Who knows maybe he and Zeus are related. Poo on Mario Lopez anyway. Congrats to you and your best friend, Zeus. He is an awesome boy! 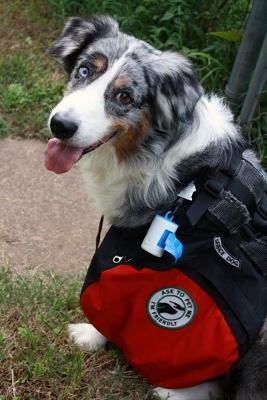 I, too, have an Aussie service dog. Sera is now 10 and I am training her daughter, Bryn, to be a service dog, too, although no one will replace my Sera!